In the first stages of your city, your population isn’t likely to go beyond the thousands and therefore it will be easier to administer all the various aspects from available workforce and functioning services to crime, health and generally keeping your citizens happy. 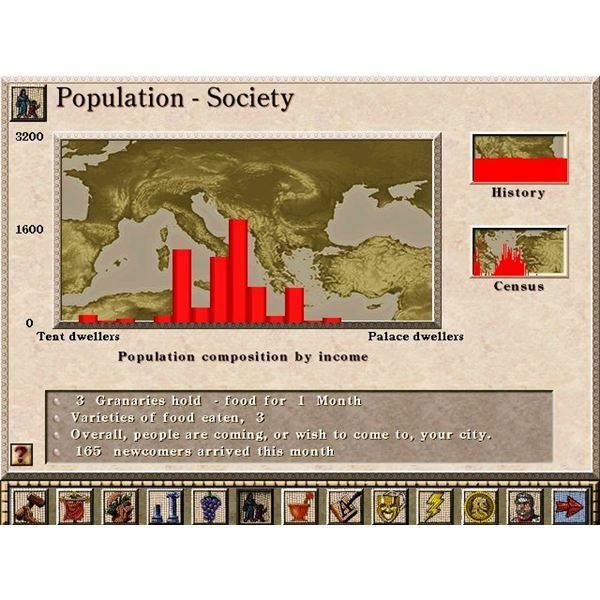 The game informs you of population milestones, so each time you add to the initial 1,000 citizens you will know that your population has increased and that you will have to be alert for upcoming problems, such as unemployment, or more likely, unfilled jobs. Eventually, as your city will expand in size, you will see all kinds of people in the streets of your city, from workers to barbers, market traders and patricians strolling about. You will be able to study your city’s demographics by visiting your population advisor, in the panel on your right. Here you will find various aspects of your population, such the number of tent dwellers present in your city or the number of palace dwellers which should also give you an indication of how prosperous your city is. In the Census window you can also determine how many people are of working age, and how many aren’t, which will tell you if there is a need for further educational establishments; you should look at districts which have low-access to schools in case there is more need for education. There is also the history of how your city’s population developed overtime: here you can see when catastrophes struck in the city by the fluctuation in the graph. Lastly, you can look at a summary of your city at the bottom of the population advisor; this will tell you if there is a need for more services, if people wish to live in your city and if you are attracting more immigrants. The overview will also offer other helpful information such as food stored. People are virtually everything to your city. You will need to attract immigrants in order for services to run and consequently attract more people by making your city a hospitable place. In the following articles we will look at how to attract people, how to allocate the available workforce in case of problems and the difference between patricians and plebeians.